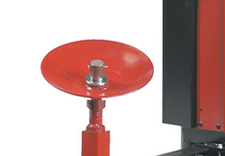 These heavy duty tire changer machines can accommodate tube or tubeless tires with rim diameters from 15" to 44". 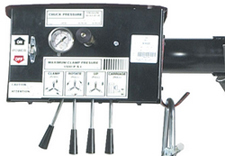 Easy-to-use swing-arm houses all hydraulic controls with a dedicated lever for each powered function. Heavy, tapered roller bearings and a dual-direction hydraulic motor provide smooth torque. Roller type tire spreader for top bead installation and bottom bead removal. Min / Max Rim Diameter 15" - 44"
Accommodates Tube or Tubeless Tires. The HIT Series can accommodate either tube or tubeless tires with rim diameters from 15" to 44". 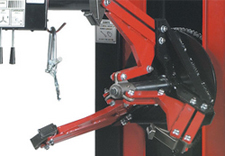 Self-centering hydraulic clamping chuck assist technician with centering the tire assembly. Adjustable pressure regulator ensures proper matching of chuck pressure to rim strength. Hofmann monty™ 3300EM Tilt Tower Tire Changer w/"EasyMont"